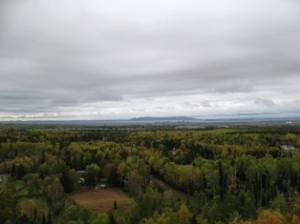 Rabbit Mountain is a popular hiking spot that leads to a lookout over the city and area. It is really disappointing to see how much garbage has been dumped here. There are several trails in the area and more of them will be posted here in the future. From the corner of Oliver Road and the Thunder Bay Expressway travel west on Oliver Road and turn Right onto Belrose Road and drive for 1.8 km. Turn Left onto Kembel Road and park at the end of the road just before the gate. Walk past the gate and follow the road up the hill. The trail is well worn and will take you along the edge of the cliffs for great views of the city, the Sleeping Giant, and Pie Island. Follow the trail sticking to the loop that goes around the larger tower and return down the road back to your starting point.